A select group of Pat's images of Florals, Landscapes for Florals, Landscapes and Italy are available as high quality, fine art print reproductions on canvas or paper through Imagekind. It's easy to order on-line and have them shipped right to your door. If there is an image of Pat's that you've fallen in love with and perhaps it was already sold or it wasn't the right size for your room or budget, now you can customize the image to have exactly what you want. Or perhaps you'd love to give a gift of art. With Imagekind it's easy to do. Framing options are available and you can even see how a painting looks in a room setting over furniture to get a sense of scale, with your own wall color and in different frames and mats before ordering. 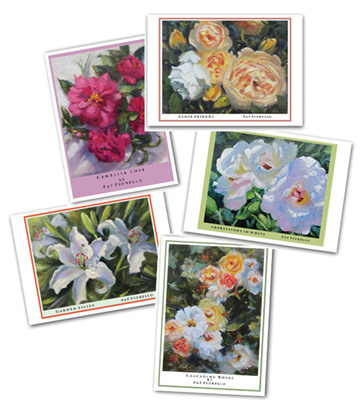 American Artists Group has released their new series of greeting cards and their floral collection features 5 of Pat's paintings. The boxed set includes 10 5 x 7 blank cards and envelopes. If you'd like some you can order directly by clicking here. Each box is $25 and there is a quantity discount if you order more than one box.